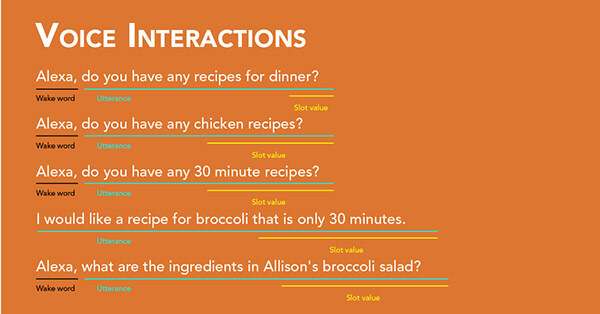 A voice assistant that provides cooking assistance is needed in kitchens of today’s society. Books and digital devices are not helpful as cooking requires the use of both hands. The chef is not always able to turn the page or scroll on a screen for further instruction. Cooking videos and cooking shows are not helpful either. The culinary host may be moving too quickly for the viewer to keep up with or the viewer’s eyes need to be focused on their immediate task. 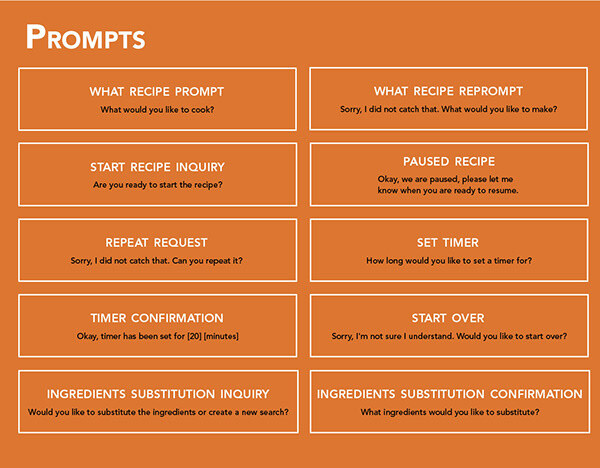 Voice user interfaces are a great solution for this problem as they can dictate out loud the recipe directions at a steady pace while the cook can focus on their culinary task. 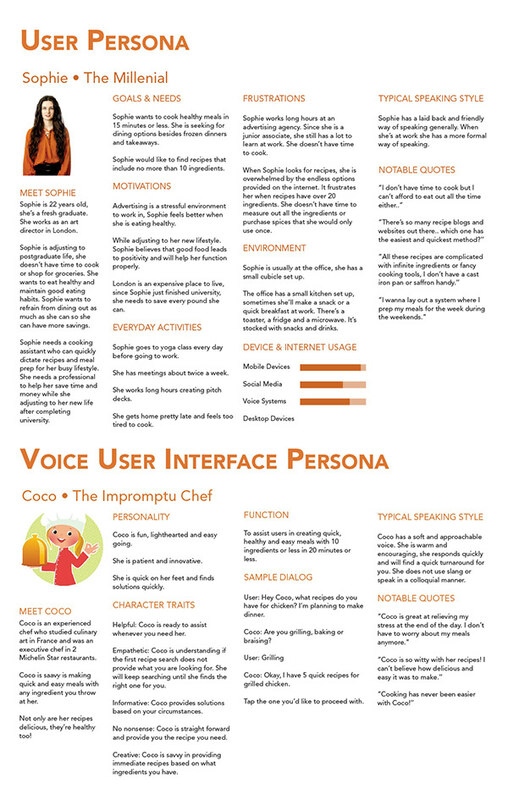 Personas were created to direct the design decisions in the development of RecipeBuddy. The user persona is a representation of the pain points and needs of the target user. During the design process, the user persona is used as a point of reference to stay on target. The system persona is designed to match the user persona’s preferences and speech patterns. The system persona is a representation of the assistant the end user will interact with. By establishing a system persona, it anthropomorphizes the voice interface. Both personas were vital in the beginning to order to establish voice scripts and prompts. They were used as references during the design process to ensure proper design choices were made for a smooth interaction with the voice assistant. User stories were created to help design the features needed in the voice assistant. 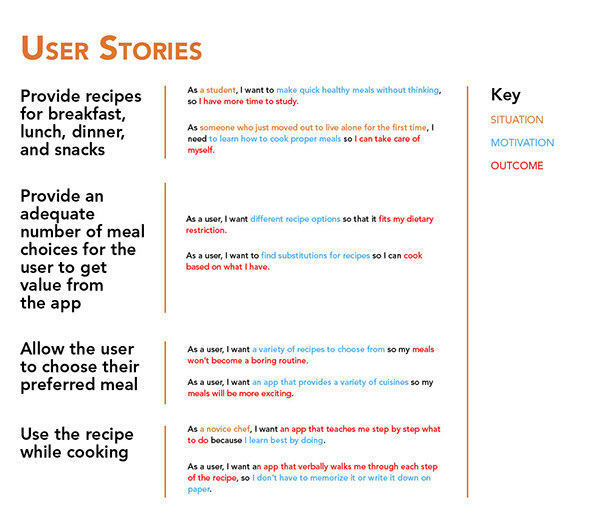 The story sets the context, identifies what the user’s needs are and what their goal is. 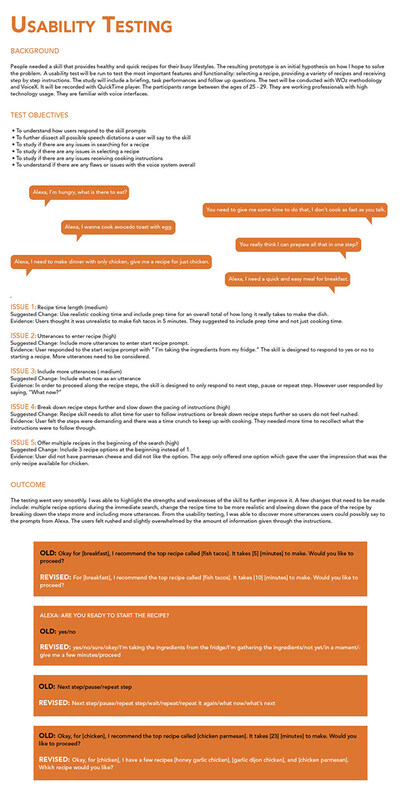 They represent the situations the user is in and summarizes what an experience needs to cover. 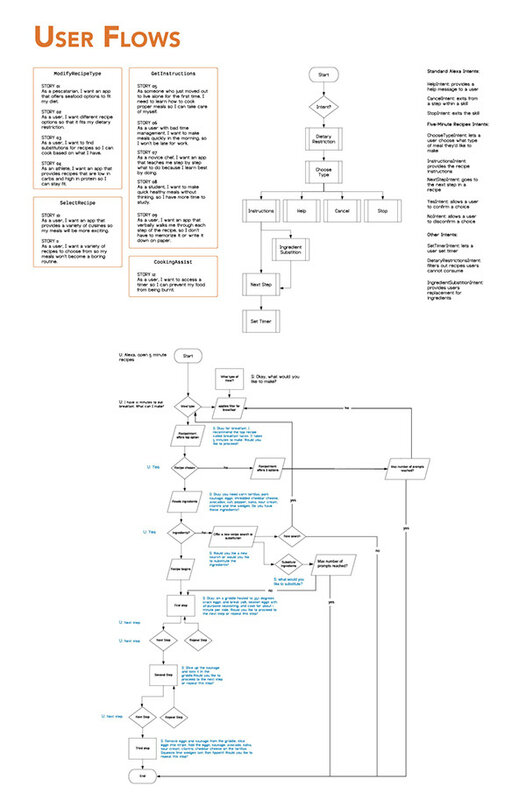 User flows are created to establish the structure of the voice interface. It maps out all the possible inputs and identifies any issues or additional use cases. The user flow functions like a floor plan of a building, it identifies all the possible paths the user can take to reach their place. Voice prompts and utterances were established to create the script for the voice interface. 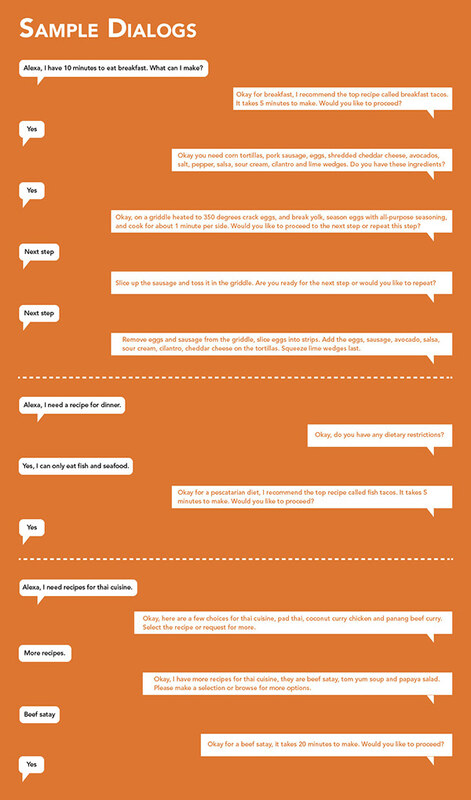 The voice script is essentially the heart and soul of the voice interface. It processes what the user will enter and responds with the appropriate prompt. 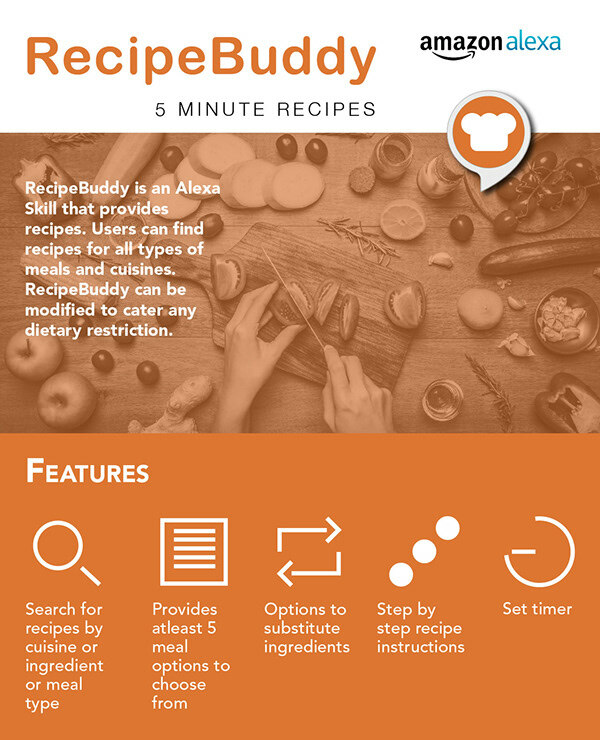 RecipeBuddy is an Alexa skill that provides recipes. Users can find recipes for all types of meals and cuisines.